Ricky Burns is "100%" convinced he will beat Michele di Rocco in their world title fight in Glasgow on 28 May after "10 weeks of torture" in preparation. 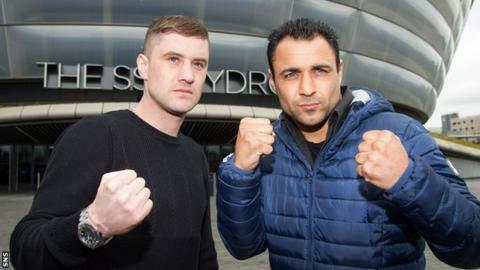 The Coatbridge fighter, 33 next month, meets the Italian for the vacant WBA super-lightweight at the The Hydro. Burns is happy to pursue a punishing regime with Tony Sims, who also trains Anthony Joshua, as he targets a third world title at a different weight. "I've been saying to everyone, 100% - I am not losing this fight," he said. "There is so much at stake. The next 10 weeks for me are going to be torture. I will really put myself through it in preparation. So at least I know whatever happens on the night, I am going to be ready." Burns won his first world crown at super featherweight in 2010 against Puerto Rican Roman Martinez, before taking the interim WBO lightweight title a year later against Australia Michael Katsidis, going on to make four successful defences. But after losing his belt to American Terrance Crawford in March 2014, Burns, who trains down in Essex, "can't wait" for another chance, in front of his home fans in Glasgow. "Whenever I fight up here, the fans are unbelievable," he told BBC Scotland. "When you go out to the ring, it is like a blur - all you can hear is just noise. "I've been in The Hydro for a couple of concerts myself and always said it would be unbelievable for a big fight. I don't need any more incentive than a third world title at a third weight." Since the fight was announced last week, Burns has been getting up to speed on his 33-year-old opponent Di Rocco, who has lost just one professional fight but will be in his first world title bout. "Tony and I have watched a few of his fights," Burns added. "Technically he is very good, he has got 18 knock-outs from his 40 wins, he is undefeated in eight years and he can punch, so we know it is going to be a hard fight. "But although I have moved up a weight, I am confident of going out there and getting the job done."